Mayer Alan Brenner wrote a series of books called The Dance of Gods published in the late 1980s and early 1990s. These books are no longer in print, but Brenner is making them available for free on his website since he feels the books fit in better with today’s popular fantasy authors than what was the norm for the genre when the series was first published. The first book, Catastrophe’s Spell, is currently available for download on Brenner’s site under a Creative Commons license. I first heard about this website and the series from a recent review of the first book on The Book Swede. It got a rave review and Brenner’s description of the series on his website sounded very interesting and showed a fun sense of humor. Also I thought it was wonderful that Brenner was making the series available for free, so I downloaded the first book. However, after reading the entire first chapter and part of the second one, I was rather disappointed. I found the writing rather choppy and the first chapter contains a character who constantly talks like Yoda, which I found annoying. I don’t like to judge a book after 15 pages, but honestly, I’m not sure if I’ll finish this one or not. There was nothing that really made me want to keep reading, and I came away from the first chapter thinking I could see why the series never really had a lot of fans. Apparently, the fans it does have love the series, though, which makes me wonder if it’s a case like Firefly. After watching the first few episodes of Firefly, I thought I could understand why it had been canceled, but after watching more episodes, I grew to love it and wonder how they could ever cancel such a fantastic show. So perhaps I should give the book more of a chance before making a decision on it. Last week I received a personalized copy of Midnight Tides and an autographed copy of The Bonehunters I bought from from The Signed Page, one of my favorite recent discoveries. Both are first edition hardcovers. 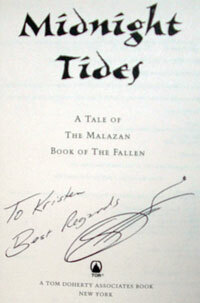 I was psyched, especially since even though I have a few autographed books, I didn’t have any that are personalized. Authors don’t come to Maine for signings very often since it’s not a very populated area. There are still a few signed copies of both Midnight Tides and The Bonehunters available on The Signed Page (although not very many). 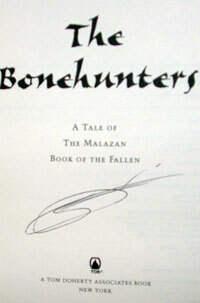 Also, there are some signed copies of The Bonehunters trade paperback available for only $5. That’s much cheaper than buying a copy of the book in a bookstore, making it a great deal. I almost wish I’d seen that one before ordering my hardcover copy (almost, since I have the whole series in hardcover so far). The Golden Compass (known as Northern Lights in the UK and everywhere other than the U.S. from the sounds of it) is the first book in the His Dark Materials trilogy by Philip Pullman. I’ve had the entire trilogy for a few years now but just hadn’t read it for some reason (well, mainly because it takes less time to buy new books than it does to read them). Since The Golden Compass movie is coming out this December, I decided I had better hurry up and read it so the movie doesn’t spoil the ending for me. Lyra, a young girl living at Jordan College in Oxford, hides in the master’s room one night just in time to see him attempt to poison her uncle, Lord Asriel. Lyra’s intervention saves Lord Asriel, who then tells Lyra to watch the master from her hiding place in the wardrobe during a meeting with him and the other scholars at the university. At this meeting, Lyra is intrigued by what she hears about Dust and severed children but cannot entirely understand what the adults are discussing. Soon after this, a beautiful and charming young woman named Mrs. Coulter comes to the university to take Lyra away with her. Early in the morning before she is to leave, Lyra is awakened and summoned to the master’s room. He gives her a device resembling a compass known as an alethiometer and tells her it measures the truth. The master warns Lyra not to let Mrs. Coulter know about his gift to her and their conversation is cut short before he gets to finish what he was going to tell her about Lord Asriel. Lyra finds that Mrs. Coulter is not as warm and pleasant as she initially seemed, escapes from her, and is caught up in adventures with gyptians, armored bears, and witches on a quest to save Lord Asriel. Her mastery of the alethiometer allows her to play an important role in fate and she is destined to fulfill an old prophecy. The world in the story is a parallel universe in which a defining characteristic of humans is that they are linked to a daemon, an animal who must stay near the human or both will suffer. The daemon is a constant companion that feels the emotions of the human. Adults have specific animals as their daemons, but children’s daemons are flexible and can take many forms until the child reaches puberty. This story is marketed for young adults, so it is a fairly short, fun book that is very plot-oriented. Characterization is flat and the dialogue is nothing impressive, but it seemed like standard young adult book characterization and dialogue. 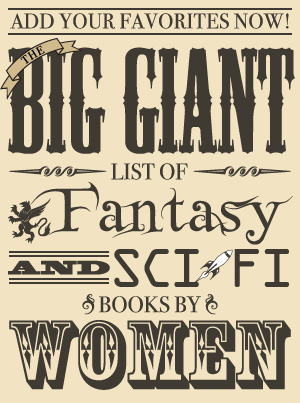 As is often the case with young adult books, the world itself seemed more imaginative than a lot of adult fantasy. It had some of the same fantasy themes but written in a less regurgitated standard fantasy way. The Golden Compass is an enjoyable tale of a child and her daemon companion who are fated to change the world. This is a light read and nothing spectacular, but it is very good for young adult literature. The ending indicates that the future books may have some deeper themes more appealing to adult readers.